ten lethal or, at the least, disabling for the v ictim. rooms found worldwide, containing over 2100 species. also been registered in Asia. nized as a potent nephrotoxin. Besides orellanine, C.
dyl and the structure is shown in Figur e 1(b). weeks from the time of ingestion of food containing C.
orellanus until the onset of symptoms of intoxication. failure resulting from damage to the tubular epithelium. toxin in C. orellanus is urgently needed. phase (gas) flow rate is low, at about 1 mL/min or less. drawback reduces confidence in sample identification. for its analysis is difficult. and its performance capabilities were explored [9,10]. flow can be adjusted up to 8 mL/min or higher . stomach content of rats after ingestion of C. orellanus. nated by the R & D Department, Jupiter Ltd., Norway. in the stomach fluid from laboratory animals. 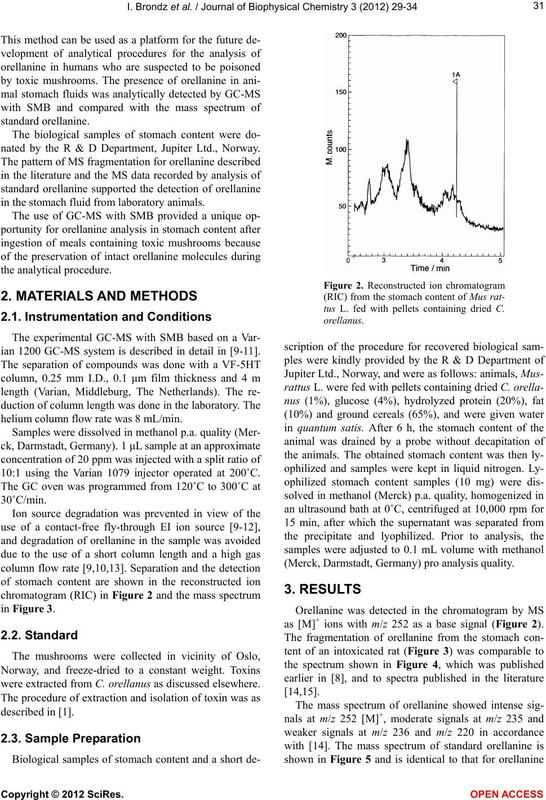 ian 1200 GC-MS system is described in detail in [9-11]. helium column flow rate was 8 mL/min. 10:1 using the Varian 1079 injector operated at 200˚C. were extracted from C. orellanus as discussed elsewhere. 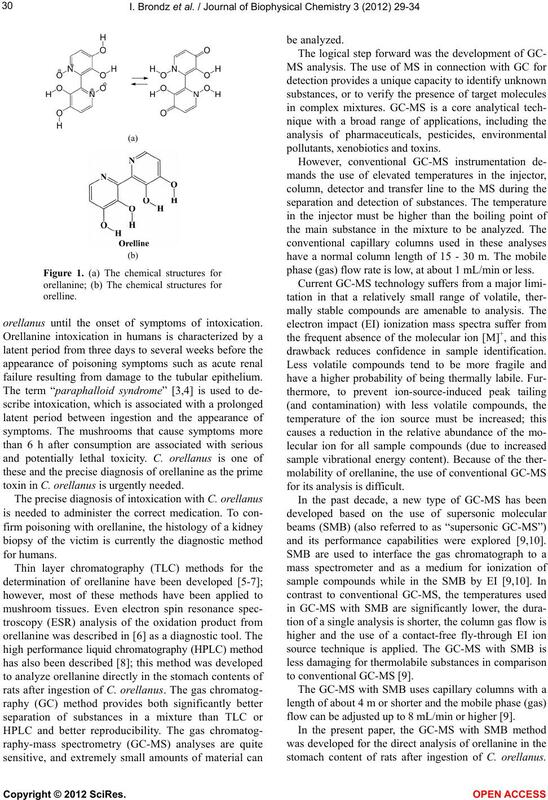 tus L. fed with pellets containing dried C.
(Merck, Darmstadt, Germany) pro analysis quality. as [M]+ ions with m/z 252 as a base signal (Figure 2). the stomach content of Mus rattus L. fed with pellets containing dried C.
of Cortinarius species mushroom poisoning, Danel et al. ing of serum creatinine is needed [22,23]. in urine or blood samples”. scribed in the text above. tissue as described in . lated with earlier published spectra as in Figure 4 .
good agreement with spectra published in [1,2,14,15]. and gives a visible mass ion signal. mushrooms in clinical and forensic medicine. way, for technical assistance in preparation of figures. Toxic properties of the mushroom Cortinarius orellanus. Archives of Toxicology, 62, 81-88. Richard, J.-M., Taillandierand, G. and Benoit-Guyod, J.-L.
mushroom Cortinarius orellanus. Toxicon, 23, 815-824.
ndaadl (in French). Revue de Mycologie, 28, 277-283.
narius Fries. 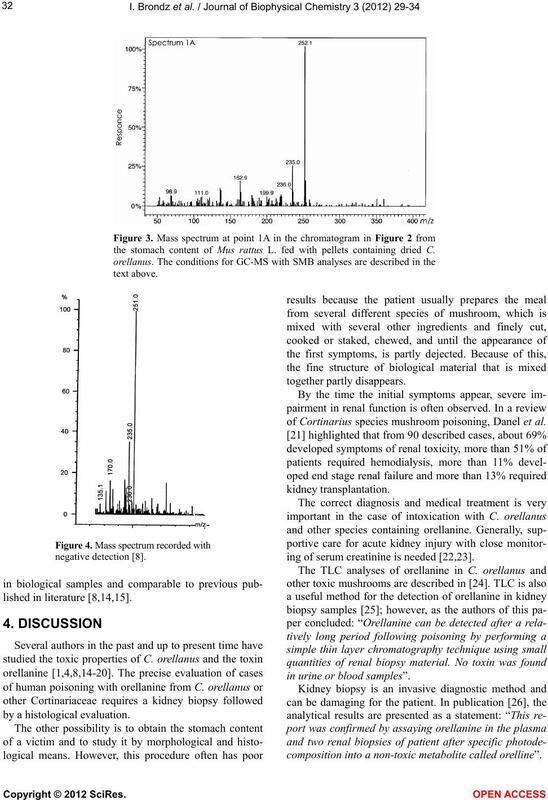 Archives of Toxicology, 53, 87-106.
of Chromatography A, 478, 231-237. 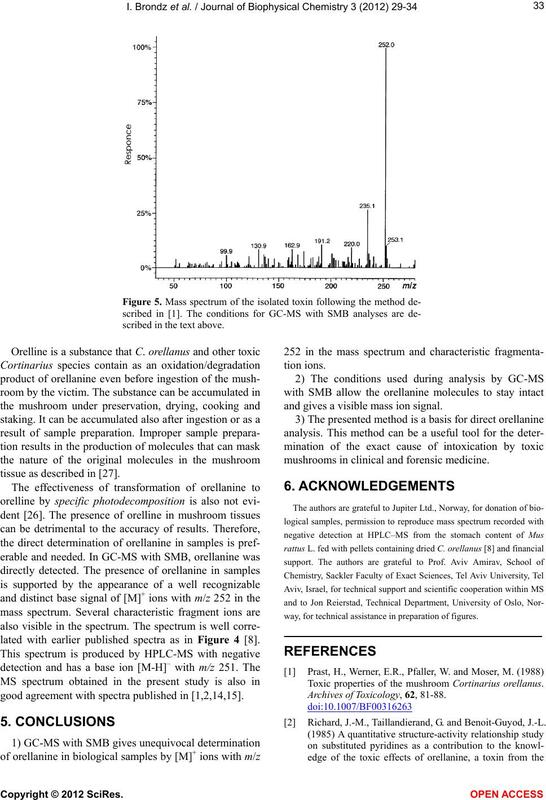 Oubrahim, H., Cantin-Esnault, D. and Richard, J.-M.
velopment of ESR, electrophoresis and TCL methods. Brondz, I., Nevo, E., Wasser, S., Høiland, K., Størmer, F.
London, 10-11 October 2011, Abstract 9.
primaquine. Nova Science Publishers, Inc., New York. phy-mass spectrometry with supersonic molecular beams. 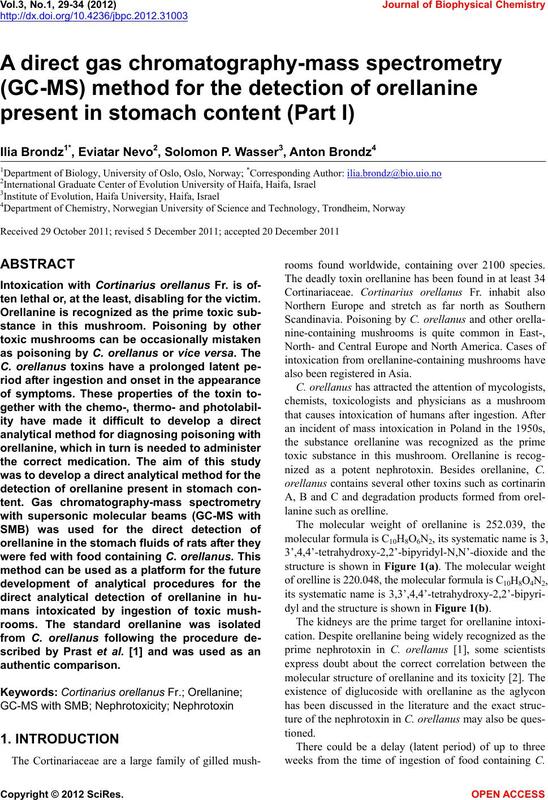 Journal of Chromatography A, 1216, 824-829.
national Journal of Mass Spectrometry, 251, 47-58. Amirav, A., Gordin, A., Poliak, M. and Fialkov, A.B. Koller, G.E.B., Høiland, K., Janak, K. and Størmer, F.C. carp from Cortinarius orellanus and Cortinarius rubellus. narius orellanus. Archives of Toxicology, 62, 242-245.
orellanine from the mushroom Cortinarius speciosissimus. tures of Cortinarius spp. poisoning: A literature review. Toxicologic Emergencies, McGraw-Hill, New York. Overdose, 4th Edition, Saunders Elsevier, Philadelphia. radini, R., Pohanka, E., Rosenkranz, A. and Pöder, R.
ogy—Clinical To xicology, 35, 63-66. Rapior, S., Delpech, N., Andary, C. and Huchhard, G.
mation through solvent extraction method development. 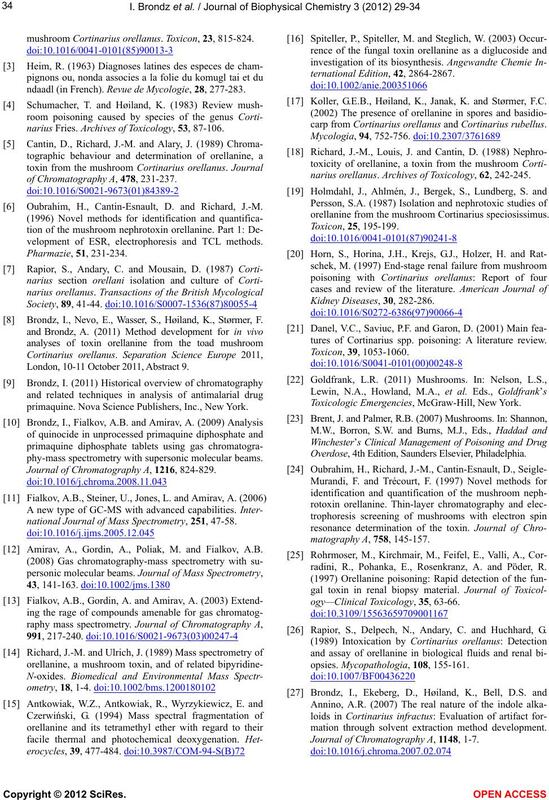 Journal of Chromatography A, 1148, 1-7.